← Also in the mail! Apparently I forgot all about this in May last year (clearly I was too busy aging): The Dark reprinted “The Heart is a Mirror for Sinners“! It is one of my favourite gothic-y ghost-y tales, and one of my faves in general. When I grow up my sincerest wish is for Mike Mignola to illustrate it as a graphic novel (although the Abigail Larson cover is pretty damned sweet too). 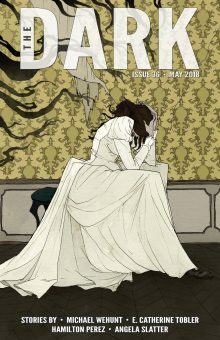 This entry was posted in Uncategorized and tagged Abigail Larson, angela slatter, Egeaus Press, ghost stories, gothic tales, Mike Mignola, Murder Ballads, The Dark Magazine. Bookmark the permalink.